Sister-friend, are you ready for Thanksgiving? We are just ONE day away! If you are like me, you have been counting your blessings all month long! One thing I am very thankful for is YOU! I lovingly call you my people, my tribe, MY SISTERHOOD! 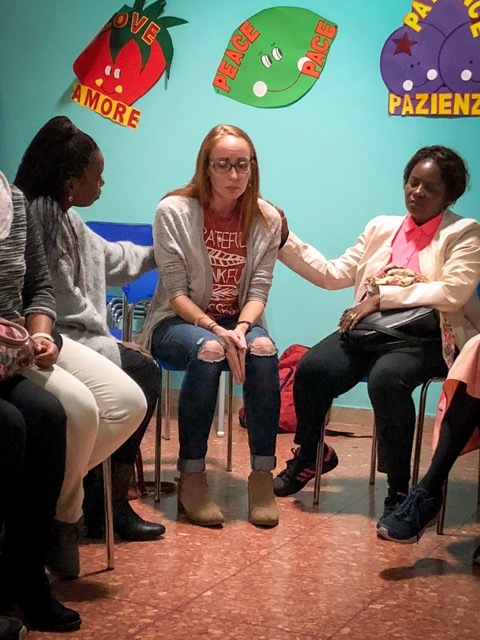 In October, I had the opportunity to travel with Church Alive to Rome and minister at an international Church with longtime friends and missionaries. Our church and women’s ministry had the awesome opportunity to help host a Generations Conference for the sisterhood of International Church Fellowship Rome. ICF is a church with over 70 nations that are represented from all over the world that call ICF Rome their home church. It was just a taste of heaven, friends! On the eve before Thanksgiving, I just have to share with you a special moment that happened while on this trip. This was a moment, I am very thankful for, that was a beautiful reminder of the Sisterhood. Alisha, a young lady from Church Alive, had been asked to share in a small group setting during the mid-week service. As she began sharing her journey of obedience by saying “yes” to the mission trip and the ripple effects it began having on her life, even while on the trip, she began to cry. Immediately, both the woman from Nigeria, to her right, and the younger woman on her left, who was from Zambia, both began comforting and loving on our sweet Alisha! They touched and rubbed her arm, ever so lightly, as they affirmed her obedience with nods and smiles! It was a quick moment, I call it a marker moment that happens when the Holy Spirit whispers softly in my heart, but a moment I will never forget! He said, “This is Sisterhood and it looks the same all over the world”! The Spirit of Sisterhood looks the same all over the world because each sister is created by the same God! We may look different, speak different languages and act different in culture and creativity; BUT, when a sister friend is a Jesus Girl, sisterhood is represented no matter where she lives! Don’t miss next week as I wrap up our Fall Sisterhood Series!